I scream! You scream! We all scream for Baskin Robbins ice cream! 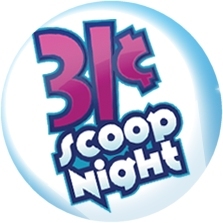 Join them nationwide on Wednesday, April 30th from 5-10pm for 31 Cent Scoop Night. Yep, that’s only 31 cents and the best part is you will be supporting our firefighters. Baskin Robbins is donating $100,000 to the National Fallen Firefighters Foundation and at some locations you will also have the opportunity to donate to your local fire charity.